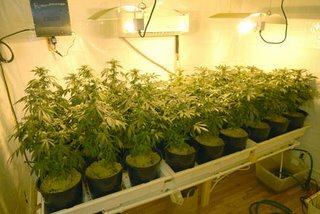 This article is to show how it is possible to grow medical marijuana, with relatively few plants in a small grow room, and make enough money to supplement your income or live frugally. The bigger your operation the higher the profits. If you grow indoors, then you can harvest more; growing outdoors has less harvest cycles per year. The costs of electricity, growing equipment, and your time tending plants all adds up; but it can be a profitable venture. every 2 months (eight weeks) and you should get 1 ounce per plant. It takes 16 ounces to grow a pound. But lets give ourselves a buffer of 20 plants or a pound and a quarter. So lets say you have five varieties of bud, that’s four plants of each kind. You would need about 5 lights (4 plants under a light), high powered lights: 400W High Pressure Sodium or 200W LED light for flowering running 12 hours per day. For the Vegetative state of raising plants to flower you can use 4′ fluorescent lights on 18-24 hours per day. So making 30,000 a year would mean growing 16 plants every 2 months, and cranking out 20 ounces 1.25 lbs sell it for 5,000 (which is high) for 5,000 6 times a year. These prices depend on your geography, more saturated markets in California have lower prices of $2,500. But that is $15,000 from 96 plants a year. Not bad for a little farming hobby. Keep it going, the longer you grow—the better you will get at it! You can increase your net profit by using energy efficient lighting and the most common mistakes are over watering and not letting your plants mature. If I were to plant 12 plant n with 12 plant which come in about 1 pound per plant, how much money do I get??? I only run 3k HPS 4 under each pull on avg 8.5ozs a piece with the addition of CO2… Prices here(RI)in the MMJ industry is about $2500-2800 a LB, every 9 weeks give or take a week isn’t bad for me.. I want to learn how to grow medical marijuana. I have a farm two garages and two barns. I am in West Virginia. Sandy give me and my wife a call at 216- 386-7022. Ask for theresa she’ll be more than happy to show you how to grow marijuana. Actually youre all retarded. If you’re growing 4 plants under 1 light, you would be getting around an ounce, maybe more if you’re smart about it. Do you guys realize that it’s not so much what lights, as it is what they’re growing in. 4 plants under 1 light will be like 3 gallon buckets. If you have a chance to grow outside take it. 1) The sun will provide all the light the plants will need. So you don’t pay jacked up electric bills. 2) You won’t have to change the light cycles, the plant and the Earth have a special bond, don’t grow inside during grow season, it’s not right. 3) Growing in soil will give the roots maximum room for strecthing, then you might be able to get a pound a plant. And waiting May to September is worth it if you ask me. Either a pound and a quater 6 times a year, or get a pound a plant with the same amount of plants, then grow indoors in the off season. Think about it, 20 plants, we’ll even under estimate here, say we get half a pound per plant. That’s 10 lbs in the same amount of time you would grow 40 plants indoors, getting 20 ounces each time. So 2 and a half pounds. Try that math out, if you write it down and use a calculator you’ll see. I don’t think I have to go further. Good luck, get off the internet and put what you’ve learned in the dirt and raise you’re first babies. I think I’m in love with you. Common sense is null and void these days. You come in here, call everyone a retard, then whip out your intelligence. Your stats aren’t conservative, they’re retarded. We are using conservative stats. Umm, that was an ounce per plant not a pound, but thank you for the math lesson professor lawson. The math doesn’t make sense to me if you produce 16 plants each one producing a lb. than that’s 16 lbs. @ 2500 a piece …about $40,000.00 every 2 months unless your just cutting off the same plants over and over …why not grow them every 3 and half months and get 100k plus a year? Previous post: Will Medical Marijuana go Corporate?